How can EEG (electroencephalography) help us understand people’s responses to outdoor environments? Due to its constraints, the technology lends itself to two tasks. The wearer of the head-mounted EEG technology is either (1) stationary in the environment, passively observing and listening, or (2) mobile. In the latter case, the EEG wearer just walks, slowly and deliberately. I am fascinated by the walking scenario, especially as the walker cannot run, talk, kick a ball, or otherwise engage with the environment. She just looks and listens while walking at a steady pace. If there are others monitoring this experience then they need to keep their distance, and walk in silence. We implemented such a scenario at a workshop in Edinburgh in October 2016, building on our experience with other formats. The theme and the method are increasing in popularity, not least as the BBC profiled explorer Daniel Raven-Ellison’s walk across the British countryside while wearing EEG to measure apparent mood changes. One of the side effects of the techniques is to render the familiar act of walking strange in new ways. This is a workshop activity, taking a few hours. It works best with 2 organisers. Buy or borrow a mobile EEG kit. The Emotiv Insight with Extender pack is handy and connects via Bluetooth to an app on a smartphone. Try it out and make sure you know how to operate the device, record the signal, and download the data to a laptop after the walk. 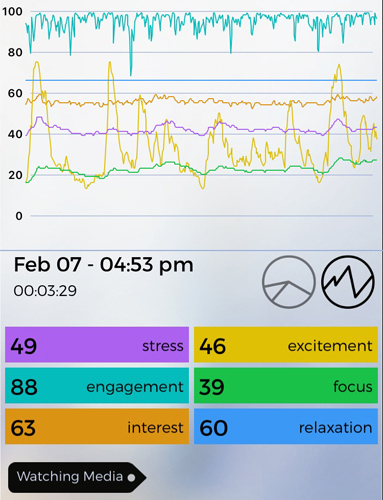 The equipment delivers a graph showing how the intensity of 6 parameters recorded from the wearer change over time: stress, excitement, engagement, focus, interest and relaxation. Choose the outdoor area for your brain walk. We have selected busy urban streets, and parks. Print out a map of the area – the bigger the better, so that people can stand around the map and annotate it. Plan a 10-20 minute walk and mark it out on the map. Flip chart paper, felt pens and post-it sticky note paper will also come in handy. Set a date, book a space (preferably indoors, with data projection and close to the area of the walk) to brief the group and lay out the map. Advertise the event and recruit a group of people. Less than 20 is best. Tell the participants to bring any of the following to the workshop: digital camera and/or smartphone, sound recorder, notepad and pencil. Welcome the group. Introduce the technology and how it works. Explain what you hope to achieve with the brain walk. Select a volunteer and prepare him or her with the head-mounted EEG kit. While this is happening the rest of the group can be assigned to various tasks: document the walk via video, still pictures, and sound recording. A timekeeper needs to annotate key moments and transitions in the walk. The rest of the group will focus on the walk, and their impressions, considering the affective (emotional or mood) qualities of the environments they pass through during the walk. The walker wearing the EEG leads, follows the designated route, and at a slow and steady pace. No one talks. Others record the journey as best they can, silently following a few paces behind. Some will annotate and record; others will simply focus on their own particular experience of the walk. Gather the group at the indoor venue. Download the data and prepare a visualization of it, generally as a series of graphs, or if you are using the Emotiv Insight with smartphone then you can connect the phone to a data projector and replay the walk as EEG readings. While this is being set up others annotate the large map with their impressions of the journey. Compare the EEG reading with the annotations on the map and discuss. It is likely that the impressions of the person who wore the EEG will be of most interest. What was he or she feeling during the various stages of the walk? Does it agree with the EEG output? Within the group are people’s impressions of the journey similar or different, and in what respects? Would the experience be any different if they were able to converse? It is likely that the workshop will raise issues about what constitutes an appropriately interesting environment. No doubt there will also be strong opinions about the technology and its strengths and weaknesses. People may also comment on how unusual the experience was. Were those who were making notes, timekeeping, and recording the walk as engaged in the environment as those who simply followed the leader? The project could end there, and suffices as an awareness raising exercise. We have run similar projects with design students who then respond to the data and the process by further analysis and critique of the environment, or they propose and develop design interventions. The EEG data can even be used in a parametric modelling exercise. In case of bad weather on the day, or equipment failure, it is good to have a pre-recording of the EEG journey as backup. The sensors have to make good contact with the wearer’s scalp. Rapid movements by the wearer can dislodge the contacts. Talking and other fascial movements reduce the accuracy of the readings as the EEG software has to filter out signals associated with muscular movement. PhD student Dorothea Kalogianni has been active in developing and refining some of these techniques. 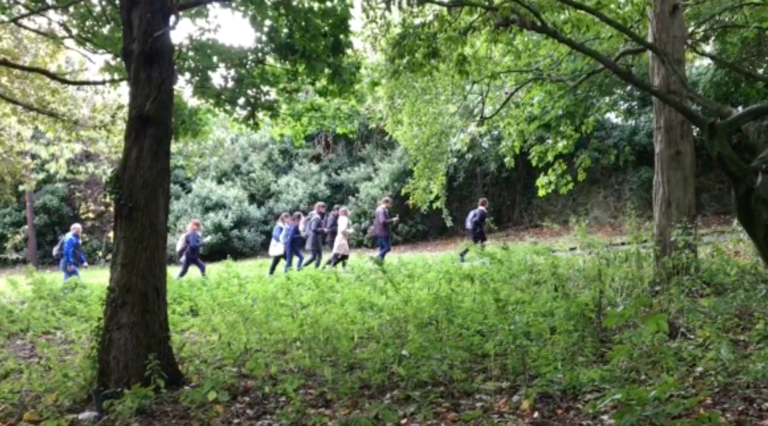 See a 3 minute video of a workshop in Holyrood Park, Edinburgh. This work was supported by the Mobility, Mood and Place (MMP) project.